A fragrant, spicy broth with egg noodles and chicken. 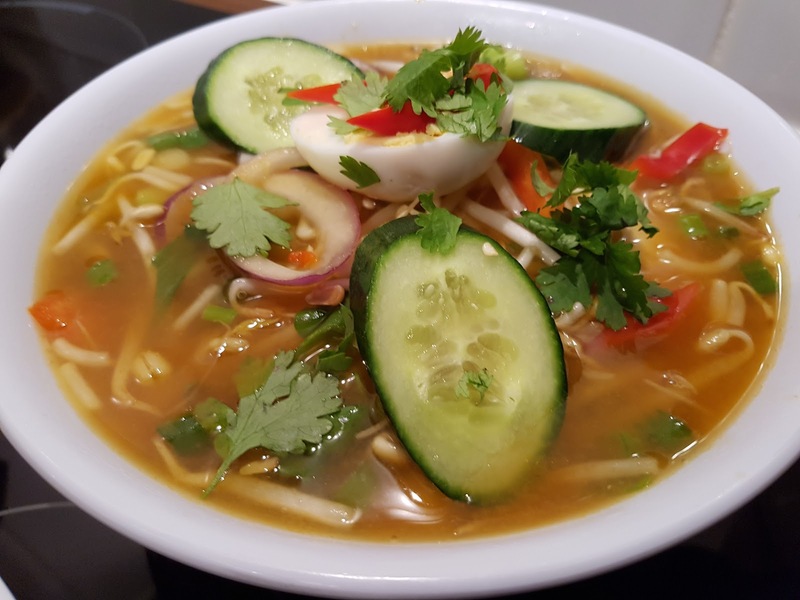 Garnished with coriander, sliced chillies, cucumber, boiled egg and beansprouts. This recipe is inspired by the wonderful fragrant noodle soups enjoyed across South East Asia. The broth is made from chicken stock flavoured with a fresh homemade curry paste. This is simmered for around 45mins to an hour to bring out all the flavours in the paste. Cooked chicken is laid on top of cooked egg noodles in a deep soup bowl. The broth is ladled on top then the bowl is completed with the garnishes. I don’t really think the pictures do this recipe any justice. I will be making this one again for certain! This recipe can easily be adapted for seafood such as prawns, mussels and white fish. For a vegetarian option use tofu, substitute salt for seasoning and use vegetable stock. A mini chopper or mortar and pestle is required for this recipe. A sieve is required to strain the broth. Put all the ingredients in a mini chopper or mortar and pestle and form a smooth paste. Chopping the ginger and lemongrass before hand makes this job easier. In a deep pan bring the chicken stock to the boil then add the curry paste. Boil for 10 minutes then reduce to a simmer and cover. Simmer the broth for 45 minutes to an hour to let the broth infuse with all the flavours from the paste. Cook the noodles as per the packet instructions, drain and then place them in deep soup bowls. Layer the chicken on top. Place a small handful of been sprouts in each bowl. Uncover the broth then bring back to a boil before turning off the heat. Ladle the broth through a sieve into each bowl covering the mixture completely. Using a sieve is important as it forms a smooth clear broth. Complete the dish with the garnishes as shown in the pictures. Place boiled egg in centre of bowl, three cucumber slices around it, then sprinkle some red chilli and coriander leaf to finish.